In 2014 the Republic of Indonesia will try to hold elections in West Papua. We the Papuan peoples refuse to vote in these elections. Why? Today West Papua is illegally occupied by Indonesia. We have a right to freedom. We will vote in a proper referendum on self-determination. But we will not vote in any election that continues Indonesia’s brutal and occupation of our land. In 1963 Indonesia invaded our country and terrorised our people. For over 50 years Indonesia has tortured and killed us. The Indonesian military has killed more than 500,000 Papuan men, women and children. For over 50 years we have been dying for our freedom. In 1969, Indonesia threatened 1024 of our tribal elders with torture and death if they did not say they wanted West Papua to be a part of Indonesia. Indonesia’s rule over West Papua is based solely on this event – the terrified acquiescence of less than 1% of the adult population. Indonesia has no right to be in West Papua. Indonesia has no right to hold any elections in our land. I am calling to my peoples across our land, from coast to mountain, from island to island. Let us stay strong and united. 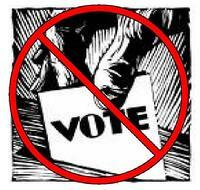 Do not vote! I am asking all the Papuan political organisations to talk to our people and tell them the truth. Do not let Indonesia fool them. My dear sisters and brothers, my beloved elders, the world is waking up to our tears and our suffering. All over the world Members of Parliament are lobbying their governments to respect our right to self-determination. 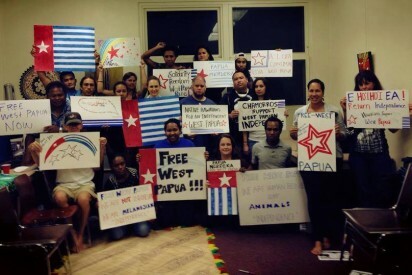 I and the people of West Papua once more appeal to the international community for freedom and for justice. We are a peaceful people. We have dignity and a right to live. How many more of us must be killed before you will act? iii) We ask the international community, and particularly the USA and the Netherlands who have both played important parts in allowing Indonesia’s occupation, to act to restore us our freedom and respect our rights as human beings, including our rights to our natural resources. We are the people you must deal with, not the Indonesian government and military. iv) We ask the United Nations to hold a true referendum among the Papuan peoples and let us decide once and for all whether we want Indonesian rule or freedom. We, the Papuan peoples, have a right to freedom. We were a Dutch colony. We had a right to independence from the Netherlands. But it did not happen. One million tribal peoples in the Netherlands New Guinea were bartered like beads by the United States in return for Indonesia’s support and access to our vast wealth of natural resources. The United Nations betrayed us and gave Indonesia the responsibility for our independence. We are still waiting to exercise our right to self-determination. If you want the Papuan peoples to vote – give us a referendum on our freedom.